Peel, core, and cut pears into small chunks. Peel and cut carrots into bite-sized pieces. Add butter to saucepan. As soon as it’s melted, add sugar and stir until fully dissolved. Add pear pieces to saucepan and stir until caramelized. Add carrot dices, stir, and let cook for approx. 5 min. Add water to saucepan. Season with salt and pepper and let simmer for approx. 15 – 20 more min. Purée soup using a hand blender. Add crème fraîche and stir in. Meanwhile, toast pine nuts in a frying pan until fragrant. 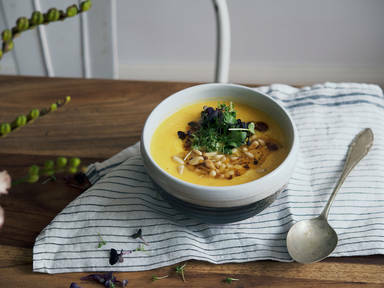 Transfer soup to serving bowls, sprinkle with pine nuts, and garnish with microgreens. Enjoy!